(Romereports) On his flight back from Bosnia-Herzegovina in June 2015, Pope Francis held a quick press conference with the roughly 60 journalists on flight. 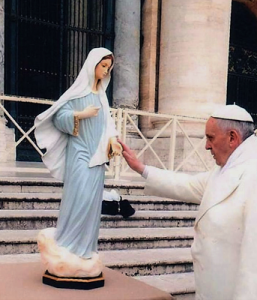 In one of his answers, he shed light the latest developments on the reported Medjugorje apparitions of Our Lady. “On the issue of Medjugorje, Benedict XVI, during his pontificate, created a commission led by Cardinal Camillo Ruini. Other Cardinals were also assigned, along with theologians and experts. They carried out their studies and then Cardinal Ruini came to me and delivered the final analysis. It was after many years, three or four more or less. They did a great job, they really did. Cardinal Muller, told me they would carry out a so called ‘feria quarta’ or special meeting around this time. I think they held the meeting last Wednesday, but I’m not really sure. We’re really close to making a decision. They will let us know. For now, only a few guidelines are being offered to Bishops. Thank you!